Hello and welcome back! This is the first of the two post for today. 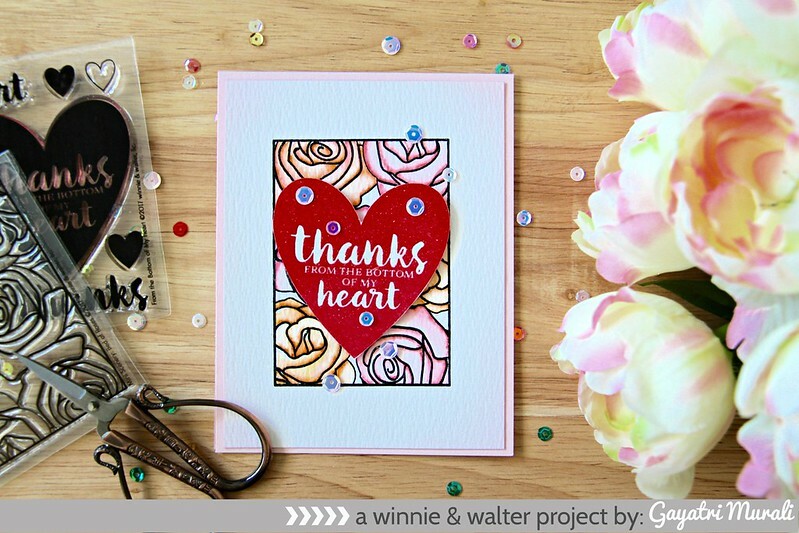 It is day #2 of Winnie & Walter’s February new release. Yesterday was day #1 and if you have not seen my day #1 post, HERE it is for you. Today I am showcasing mini stamp sets – Mini Scenery: Bed of Roses and From the Bottom of my Heart stamp set which is free with $25 purchase. 1. My card base is made of light pink cardstock from my stash. 2. The front panel is Tim Holtz distress watercolour paper on which I black heat embossed the Mini Scenery: Bed of Roses stamp image. 3. I coloured the image with Zig clean colour brush pens. 4. Then I stamped the heart image from Bottom of My Heart stamp set using Red dye ink and then with versamark and heat embossed using clear embossing powder. The process of stamping with versamark on a stamp image is easy using MISTI. 5. I wanted a good dimension on the heart shape. When the embossing powder was hot, I added more embossing powder and heat set. I repeated the process thrice. I left the heart shape to dry as it is quite thick. 6. When dry, I used scissors to cut the image out and adhered on top of the watercoloured image using foam adhesives. 7. The panel is glued down to the pink card base and embellished with sequins. Both sets are mini sets and From the Bottom of My Heart stamp set is free with $25 purchase. Thanks for stopping by my blog today. 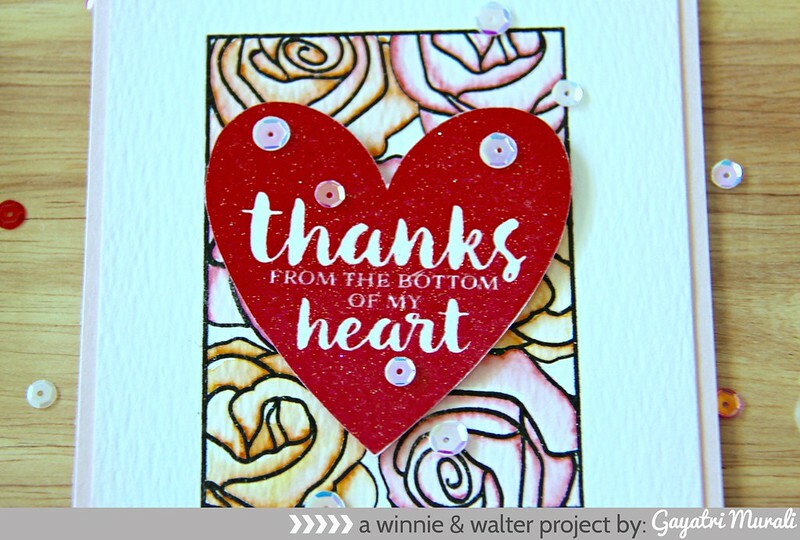 I will see you tomorrow with Day #3 of Winnie & Walter new release. What a pretty card. Love the rose stamp. Such a pretty card!! I love the stamped watercolor background you did! Really love this stamp set, I have to get it next time someone goes to the States! Ooooh, Gayatri, this is AH-MAZING! ♥ IT! Gorgeous – love that sentiment!